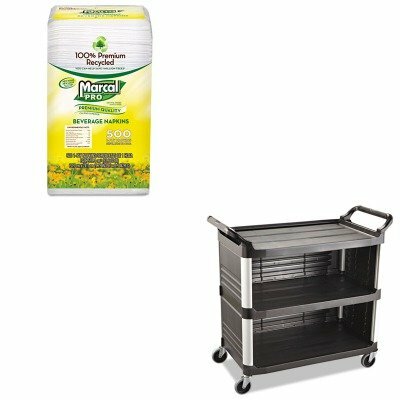 lt;stronggt;RCP4093BLAlt;/stronggt;lt;BR/gt;Rubbermaid-Black X Tra Three Shelf Bussing Cart, Enclosed On 3 Sides 300 lblt;BR/gt;Sized to carry large loads and reduce return trips. Rounded corners won't damage walls. Upscale appearance is ideal for institutional, warehouse or front office use. Large textured shelves hold a variety of equipment and supplies. Durable, structural web construction resists scratches, chips and rust. Lightweight and easy to handle with quiet, nonmarking casters. Color: Black Capacity Weight: 300 lbs. Caster/Glide/Wheel: Four 4amp;quot; TPR Swivel Casters.lt;BR/gt;lt;BR/gt;lt;stronggt;MRC28CTlt;/stronggt;lt;BR/gt;Rubbermaid-Black X Tra Three Shelf Bussing Cart, Enclosed On 3 Sides 300 lblt;BR/gt;Convenient, space-saving Easy Reach pack. Materials: Paper Colors: White Width: 9 3/4amp;quot;.